I’m a day late on this, but here’s my post for my longest chain of tombstone photographs for this week’s edition of Randy Seaver’s Saturday Night Genealogy Fun. It begins with my grandmother – Ada Evans Garner and goes through to my 7th great-grandmother, Mary Eve (nee unknown) Fry. It’s time for another Tuesday’s Tip – a blogging prompt suggested by members of Geneabloggers. 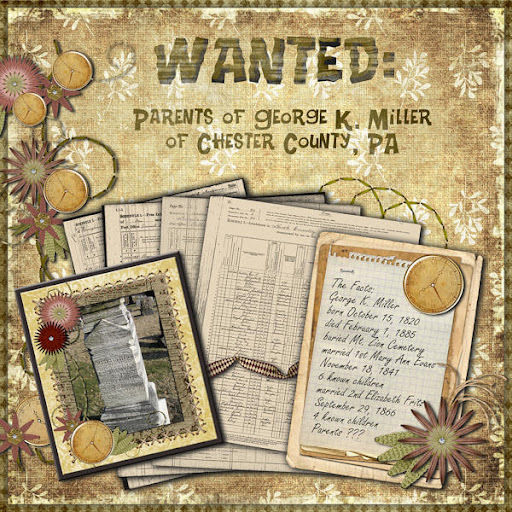 So you want to make a digital scrapbook (or maybe even a traditional paper scrapbook) of your ancestors. The problem is that you don’t have any photographs of some of them. One solution is to include tombstone photographs with your journaling. It’s not as morbid as it might sound at first. 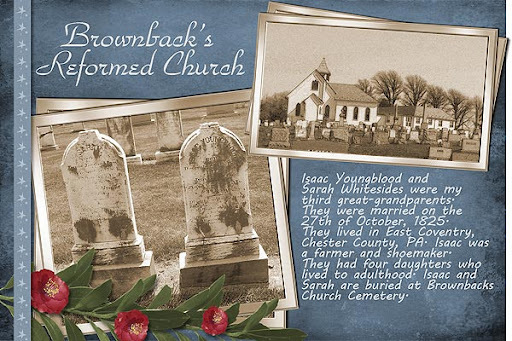 Here’s a page I made for my 3rd great grandparents Issac Youngblood and Sarah Whitesides. They are buried in the cemetery at Brownback’s Reformed (now UCC) Church in Spring City, Chester County, Pennsylvania. As you might be able to tell, their tombstones are pretty worn and may not be legible at all in a few more years. So this could really be a nice way to preserve them for future generations. Credits: the tombstone photograph as well as the church/cemetery photograph were taken by me a few years ago. The scrapkit is one of my own.